Anyone managed to find the list of probiotics? I’m also looking for the probiotic list. Not found most of the lists mentioned in the book so far, I’m afraid. I’ve stuck to Kefir for probiotics and inulin powder in green tea for prebiotics since they were recommended on the Michael Moseley programmes. Hi, have been looking for the list too. VSL#3 was mention in the book so did a google search and found the supplier. Just ordered a batch today… not cheap though. VLS#3 MAY decrease bloating. I’d welcome news of how successful you find it. Thanks for the info about Amazon as a supplier. Good luck! Michael has written about probiotic brands in his post “A note from Michael on the book” in the Welcome section of the forums. Unfortunately the suggested suppliers for probiotic pills doesn’t ship to Australia. Any suggestions for an Australian supplier? I am also looking for a good quality probiotic in Australia. I suffer from mild IBS and have been recommended to take them by GP. I am currently taking Faulding IBS support probiotic and sometimes I have thought they have helped and other times not so sure. I have had a fair amount of antiobiotics recently for tooth infections and then also with surgery so I have been taking them then but not sure if really helping or not as still got diahorrea from the antiobiotics. I have just purchased Udo’s Choice Probiotics having googled best probiotics to use. They arrived today and I will let you know how I find them. Would be good if CG Admin could take a look at them to see if they are what they claim. Yes so hard to know which ones might be effective. On looking at the Faulding ones they only have 1 type of lactobacillus so suspect not great whereas a powder I bought recently had 10 strains. It was expensive and neither my husband or I liked the taste even if tried to disguise it. As didn’t like it I have not kept what the name was. We travel quite a bit and especially like to have them when traveling so really need a capsule that you don’t need to refrigerate. Would like to know how you go with the Udo’s. Are they a capsule that is non refrigerated? They are a capsule that should be refrigerated, although they say on their website that they can be out of the fridge for short periods of time while travelling – although they don’t say how long that short period is, guess it would depend on the outside temperature. I think I might buy the VSL 3 ones when away. Surprised nobody has yet mentioned Symprove – http://www.symprove.com. In trials it was one of only three products which delivered the number of bugs as advertised, survived stomach acid and reproduced in the gut. You need a three-month course and it’s not cheap, but it does seem to help. It’s a liquid you keep in the fridge by the way – even took mine on holiday to the US! I am in Australia and gave been diagnosed with IBD. With the aim of not being on medication for the rest of my life, I saw a dietitian who specialised in IBD and she prescribed a probiotic from the Bioceuticals range. Check out their range of probiotics; I was told they are one of few supplements with strong research evidence behind them. Does anybody know if probiotics will help or exacerbate FODMAP intolerance? I was told to take the probiotics along with a FODMAP diet and noticed a significant improvement in my symptoms. Hi I have been using home brewed milk kefir from e bay purchased grains so that it only costs me 5 minutes per day and the cost of the milk to feed them. I have had the best improvement to my and my husband’s health EVER and I’ve been subjecting the poor man to every new nutritional idea I can find for years! I thoroughly recommend fermenting your own kefir. It is really easy. I think that the most natural products from foods usually turn out to work best for optimum health and I’ve also read that probiotics delivered in liquid form deliver the most viable probiotics. So before you spend loads of money on shipping supplements I would try kefir. Hi SueC unfortunately milk is one of the FODMAP intolerance foods to avoid . I wonder if kefir can be made from lactose free milk? My pleasure. I used Bioceuticals which are apparently one of few evidenced based probiotics. You can get them from some pharmacies or health food stores like About Life or alternatively order online. Thanks for the info about Bioceuticals and where to buy. Much appreciated. The trouble with FODMAP intolerance is that most of the healthiest or yummiest foods like all the legumes, apples, pears, figs, garlic, onions, kefir etc, that all help the gut can’t be tolerated. I wonder if there is, or will be, an actual cure for FODMAP problems. Difficult to get ones Gut back on track when over half of all of the most beneficial nutrients are off the list of tolerated foods. I know. I have been reading the book and many of the recipes call for foods that I know cause problems for me. When I started on the FODMAP diet, I followed it quite strictly just so that I could give myself the best chance of reducing the inflammation. Once things settled down (i.e. my symptoms started to disappear), I was told I could reintroduce some of these foods again in a slow and graded way as many of the intolerances are based on a cumulative effect. For example, I could start to reintroduce dairy again in small amounts. I noticed that there were some foods that I could tolerate in small-moderate amounts (dairy) and other foods that I couldn’t tolerate at all (onions, apples, pears) which has allowed me to work around it to some extent. Hope that helps! I also follow a FODMAP diet and have found it has really helped with certain inflammation, especially in my joints, and resolved a runny nose in the mornings. 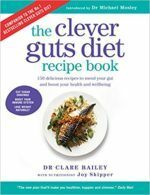 How does the ‘clever guts’ diet fit in with the restriction of foods on a FODMAP diet? Some of the microbes in kefir grains need milk sugars (lactose) for food – this is converted to lactic acid. The resulting lower pH affects which other microbes thrive. Residual lactose largely ends up in the whey portion of yoghurt or fresh cheese – this can then be drained off (and is in Greek yoghurt and Skyr). Hence hard cheeses are much lower in lactose than milk. Some research suggests live fermented products with residual lactose are better tolerated than pasteurised ones. How much residual lactose and how much live culture is present in DIY kefir is likely to be highly variable. New to the whole forum thing and new to gut health too! I am in Australia and just thought I would share a probiotic that my nutritionist put me onto. It is called ‘immunity fuel’ and is a certified organic probiotic superfood. It contains 15 strains of live probiotics and 19 nutrient rich whole foods. It works by using the bacteria and then the wholefoods and fermenting them together. Just wondering if anyone can give me any feedback on is? Have you tried probiotics this way and have any feedback on how effective this actually is?? For NZ and Australian users of this forum, Nutralife do probiotics with the HOWARU strains and they have one with 50 billion CFUs of various strains (L. acidophilius, B. animalis ssp. lactis, HOWARU B. animalis ssp. lactis, B. breve, B. logum, L. casei, L. paracasei, L. plantarum, L. salivarius ssp. salivarius, L. rhamnosus and L. delbrueckii ssp. bulgarius). I take this probiotic due to the variety of strains and number of CFUs. All: pre/pro-biotics are NOT the same. There is no one-size-fits-all approach. The appropriate pre/pro-biotic will very much depend on what problem you are trying to solve. I highly recommend Symprove for irritable and inflammatory bowel disease. Unlike some of the snake-oil-peddlers wares (!) it has been clinically proven. VSL #3 has been extremely invaluable in my healing process. However, I was very distressed to read the latest study done by consumerlab.com in which they discovered that the Italian formula “may significantly affect the response and health status of the person ingesting it”, due to the greater number of dead bacteria. And, according to their website, it’s no longer possible to buy the original formula made in the U.S. I must say how very disappointed I am that the product I relied on may no longer be safe and effective. You can access the probiotic reviews by Consumer Lab at http://www.consumer lab.com. Under reviews, just select probiotics. Consumer Labs has impartially tested products for over 20 years so I rely on their testing rather than just take the word of the manufacturer. does anyone know how good the Jalna brand of yoghurt ( pot set) is in australia plse ?